Jim Stone calls himself an “independent investigative journalist” and has an eponymous blog: JimStone.is. Stone claims special skills and insider knowledge as a former, but disaffected, U.S. National Security Agency (NSA) operative with “above top-secret clearance,” although he never specified what position he had held there. The NSA insider knowledge would account for why Stone rarely cites his sources (more on that later). But being a disaffected NSA agent who is now dedicated to revealing the truth is also the reason why he is targeted by the NSA and other intelligence agencies. In fear of his life, he fled the United States for Mexico, where he continues to be a truth warrior despite his website being constantly harassed and attacked by the shadowy spooks because the information he imparts to his readers is so exclusive and important (more on that later). For all that, Stone solicits donations from his readers, who obligingly shower him with the monthly minimum he claims he needs to support himself and his wife in an undisclosed location in Mexico. This post is about who Jim Stone is: He is neither a former NSA agent nor does he have special insider knowledge. “Stone guards his privacy with a virtual chastity belt of anonymity. While he slips in the rare quip about his personal life now and again, his readers know relatively little about the man whom they idolize, the man to whom they donate their hard-earned money in order to preserve that his brand [sic] of no-nonsense truth…. (1) Jim Stone is the alias of a man named James Milford Heikilla. 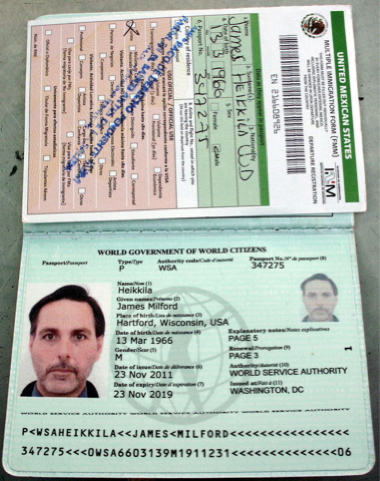 Below is his passport. He was born on March 13th, 1966 in Hartford, Wisconsin. Abandoned by his parents as a toddler, he spent his childhood in foster care, where he was tortured and abused by foster parents and siblings. He attended Prescott High School in Prescott, Wisconsin, and graduated in 1983. He met his first wife in Wisconsin; she filed for divorce and they legally separated in 1993. Heikkila divorced his second wife, citing her drug issues and infidelity. He met his third wife in Utah; adopted her son from a previous relationship and they eventually had a daughter together. James filed for divorce in August of 2001. In 2009, his fourth wife helped him pen his first truther report, “Tainted Nightmare,” which outlined the dangers of the Swine Flu vaccines and the plans to unleash the tainted vaccines onto selected members of the populace. Upon hearing that she was leaving him, Heikkila emptied a can of pepper spray in her face. He was charged by the State of Maryland with second-degree assault and, later, domestic violence. He told his readers that the assault charge was due to a can of pepper spray accidentally discharging in his luggage and inadvertently striking a law enforcement officer, resulting in trumped-up charges. This was a lie. He now resides in León, Guanajuato, Mexico with his fifth wife. He was a mill worker at Geneva Steel in Vineyard, Utah until it shut down in 2001. He later started his own company, selling, renting and stocking vending machines. He was a locally renown pianist in Massachusetts, before leaving the world of music in 2003. In early 2001, Heikkila introduced himself to the online world with StoneBound.com, dedicated to his music. In early 2008, he launched a website dedicated to his photography. ‘Jim Stone: Freelance Photographer’ featured his original images. In early 2013, he started another site, “Budget Camera Review’. “In September of 2011, Heikkila claimed to have been arrested and illegally held for 6 days. There is no legal record of this ever occurring. He claims that law enforcement officers destroyed all of the inventory and equipment for his vending machine company. He wanted to leave the country, but claims that the U.S. government denied him a passport because he was an NSA whistle-blower. He was actually legally forbidden from getting a U.S. passport because his court-ordered child support payments were in arrears. Let’s move on to Heikkila’s beliefs. He constantly espouses his hatred for the Zionists [namely the Ashkenazi Jews], but does he subscribe to any particular religion himself? He says that he was raised as a Christian. He claims to have converted to Islam during his fourth marriage, taking on the name ‘Annas Heikkila’ during that time. From 2005 to 2008, he attended Jewish services in Montreal and Vancouver, Canada. He was in the process of converting to Judaism until the Jews SPILLED THE BEANS ON THE JEWISH CONSPIRACY and realized they would have to kill him. They poisoned him but he was [magically] able to cure himself with pickling salt, vinegar and ammonia window cleaner. Since absconding to Mexico with his fifth wife, Heikkila claims to be on the run from Israeli-sponsored assassins. He went so far as to claim that 30 ‘storm troopers,’ replete with helmets, shields and riot gear, were once camped out at his domicile, waiting to murder him. Luckily, he spotted them from afar with his god-given night vision abilities and subverted the attack. Not being a former NSA spook with “above top-secret clearance,” blogger Jim Stone has no special insider knowledge. How do I know that? Because I follow the same AltMedia chat forums and message boards (Reddit, 4chan, 8chan) that are Stone’s sources, although he never credits them as his sources of information. 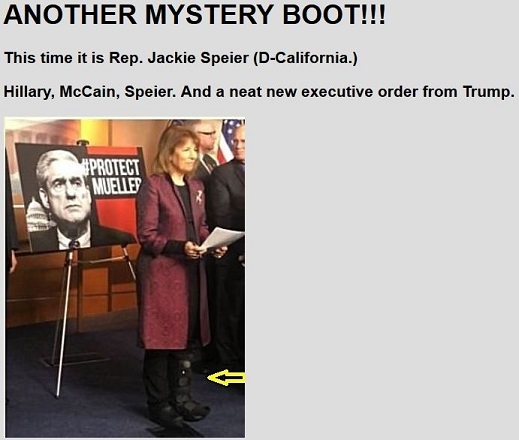 On December 23, 2017, I published the post “Epidemic of medical boots: Now it’s Rep. Jackie Speier,” with a pic that I found on Reddit, but I painted in the yellow arrow pointing to Speier’s medical boot. As you can see for yourself, that’s exactly the pic that Jim Stone uses as his own, without citing FOTM as his source. Shame on him. 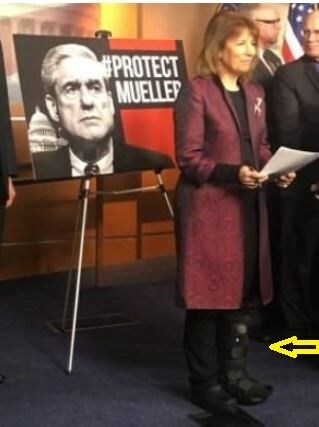 On December 12, 2017, Jim Stone trumpeted that Congress had an emergency meeting to lock up Hillary Clinton and gave a link to a video on YouTube titled, “JUST IN: Congress had an emergency meeting to lock up Hillary Clinton. See the outcome”. As you can see, the video has been taken down from YouTube. To conclude, the blogger “Jim Stone” is not who he claims to be. He is a 5-times married man named James Heikkila; a fugitive from the Unites States for child-support and domestic violence; a Muslim convert (which would explain his hyper-defensive dismissal of reports of female genital mutilation in America, and his uncritical support of Iran); with but a high school education, which makes his claim to have worked in the National Security Agency “with above top-secret clearance” even more laughably ridiculous. “Jim Stone” is also a con-man, who has conned readers across the world to support him with their hard-earned money. See also “Expat blogger Jim Stone, who lives in Mexico, goads Trump supporters to violence“. 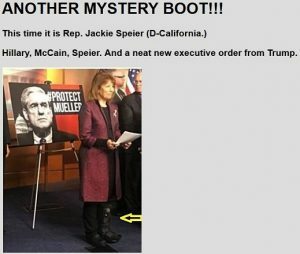 This entry was posted in Alternative media, conspiracy, NSA and tagged Henry Makow, Jim Stone, Jim Stone is James Heikilla, Merit Freeman, Rep. Steve King. Bookmark the permalink. Jim Stone took majority of his Swine Flu information from Dr. Lorraine Day’s website. He’s a fraud and …. much more than a fraud. It’s better left unsaid. Stay far away from Heikkila.